Seriously in need of demolishing, total eyesore. Closed down. On one hand it was a shame, and maybe it was coming. Was in one evening for onenight before the closure and the atmosphere afterwards was 'cagey'. There was a chavalanche descending on it, most Fridays, and a northern soul DJ told me some records he had were nicked and damaged by punters. It was a better feel , more 'studenty' on the quiz night I came to, 2 weeks before it went. Still, it wasn't packed at all. And there are better pubs nearby (PoW and PK's). Still , back in the day it was a great music venue (80s and 90s), possibly grabbing the mantle from the Goose. RIP 'The JUg'. Closed, was OK for gigs, but beer and atmosphere was rubbish. 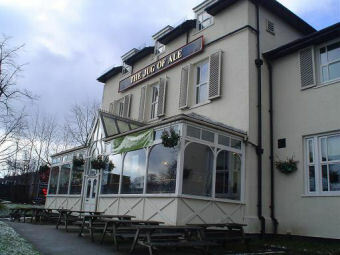 Still rating it as a 10 though, so it is now closed but still rated higher than the Bulls Head, or Elizabeth of York. Which says it all. CLOSED. For better or worse. Shame in a way as When I saw David Devant & His Spirit Wife here it was one of the 10 best gigs i've ever seen.